We are highly experienced firm widely known for the quality of our offered Garment Tags. By using modern machinery, these products are designed in accordance to the latest market trends. The new trend for tags in garments include printing on thick like twill cloth and after operations such as die cutting, riveting and thread are all done under roof. After the customers’ final approval of bulk order, it takes us 3 - 4 working days to print, dry & pack the labels. We are renowned companies of market for providing the premium quality collection of Printed Garment Tags, which is enormously employed in the market. Backed by the help of well-informed professionals, we have achieved a prominent place for offering a varied range of Clothing Tags. 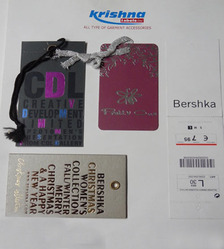 We bring forth a magnificent range of garment tags for our clients. 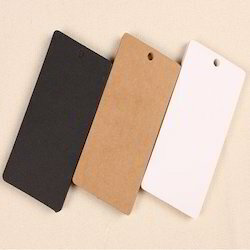 Designed by our craftsmen, these attractive tags can be availed in different colour and styles. Furthermore, our experts make use of high grade raw materials in developing these tags and paper one piece box used for garment packaging. We are trusted by consumers for offering Garment Cartoon Tag in various sizes. Moreover to this, these tags are made precisely using best input and machines. Offered cartoon tags are light in weight and available in the market in perfect color combination. We supply these tags safely in market. Our firm is one of the top choices of our customers for making available high quality Garment Tags, which is available from us at economical price.